Today Microsoft is announcing several new features that will allow Office 365 users to become even more productive in communication services such as voice, video and online meeting experiences. 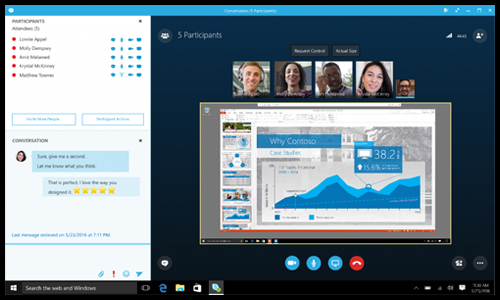 Kirk Koenigsbauer, corporate VP of MS Office, writes in an article today that Microsoft will allow organizations the ability to replace their legacy meeting and phone systems with innovative services built on the familiar Skype for Business experience, all naturally integrated within Microsoft Office 365. Skype Meeting Broadcasts - on a much LARGER scale you can now do a "broadcast" meeting to over 10,000 virtual attendees. This can be accessed on most computers, smartdevices and browsers. Cloud PBX and PTSN Calling - allow companies to transition to the cloud with Office 365 as its central for managing users' communication and allows companies to subscribe to Microsoft managed calling plans and phone numbers. This will start in the United States and spread to other markets as 2016 progresses. "Microsoft is the only company that has built this combination of capabilities — a cloud business phone system including dial tone, and a complete meetings solution including audio, video, content sharing and messaging service — as a core part of a complete productivity and collaboration suite, available across mobile platforms and at a global scale." Advanced Threat Protection - improved malware and virus protection using behavioral analysis. Delve Analytics - utilizes dashboards that allow people to manage their time effectively and see how they are spending it. Advanced eDiscovery - integrates Equivio machine learning, predictive coding and text analysis to reduce costs that come with sorting large amounts of data for eDiscovery. Power BI - analytics that enables information workers to visualize data with greater efficiency through live dashboards, reports and visualizations. So, if you are an enterprise customer with need of an enhanced yet centralized communications platform, then you should definitely be looking into Office 365 and Skype for Business. Contact Custom Information Services for more information about Microsoft solutions, Azure cloud services and Dynamics GP implementations and consulting.